Pregnancy is accompanied by various physiological and physical changes, including those found in the cardiovascular, respiratory, gastrointestinal, renal and haematological systems. 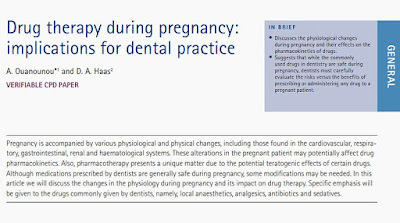 These alterations in the pregnant patient may potentially affect drug pharmacokinetics. Also, pharmacotherapy presents a unique matter due to the potential teratogenic effects of certain drugs. 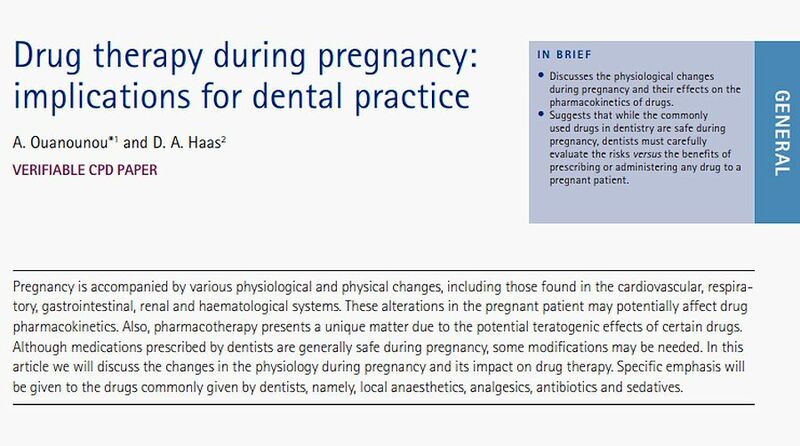 Although medications prescribed by dentists are generally safe during pregnancy, some modifications may be needed. In this article we will discuss the changes in the physiology during pregnancy and its impact on drug therapy. Specific emphasis will be given to the drugs commonly given by dentists, namely, local anaesthetics, analgesics, antibiotics and sedatives.